If you're into rocking out for God..
and if you accept the deep throated growling vocal talents..
then this album is for you. i'm not a big fan of screamo or growling, but it's done well and i don't cringe at all. it's not just wailing guitars.. it's powerful! Next time you go to a Christian Bookstore to buy music, keep Colossians 3:16 in mind. 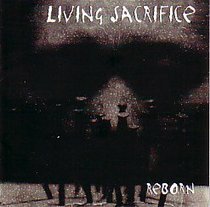 Reborn Living Sacrifice fist album on Solid State there music has always been heavy but at the same still rocking out for god i look at this as praise with death metal cos that's pretty much what it is so if like heavy music this is the album to get.